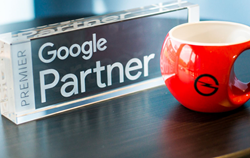 Gragg Advertising, a recognized global leader in digital marketing, has been named a Premier Google Partner. We are thrilled to usher clients into the next level of innovation in digital marketing. Gragg Advertising, a recognized global leader in digital marketing, has been named a Premier Google Partner. This distinction places Gragg among only three Premier agencies in the Kansas City area that specialize in both Search and Mobile Advertising. Gragg Advertising is a full-service direct response marketing agency located in Kansas City, MO and driven to help brands play useful, positive roles in their customer’s lives. Gragg has been recognized by Forbes as one of the world's "Top 100 Agencies that Know Social Media and Google". Visit graggadv.com to take a peek behind the curtain and see how Gragg designs strategies to help you connect with customers.